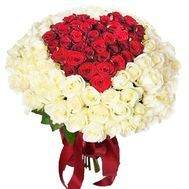 Bouquet of flowers heart is the original design decision for any romantic holiday or occasion, when you want to talk about feelings. 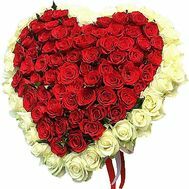 It is a bouquet in the form of a heart that will help you to speak about the hidden things in the best and most pleasant way, bypassing the constraint. 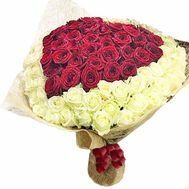 Always, when I want to say something special, which goes beyond the ordinary, we choose a bright and colorful bouquet. 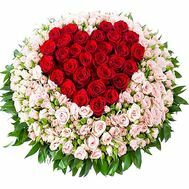 The heart of roses, this lush and bright flower arrangement, has gathered in itself all the most gentle and quivering of the world of floristry, and is ready to give it to the recipients. 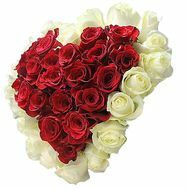 You can buy a bouquet of roses in the form of a heart at any of the days, including the weekend. 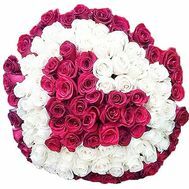 Our courier delivery works daily, whenever you need our services! 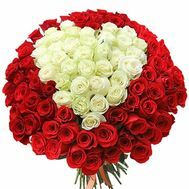 To give roses bouquets is accepted in every country and in every culture. 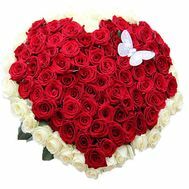 Especially the red heart of roses - a symbol of sensuality and passion - is valued on Valentine's Day: the day when love is spoken at every turn. 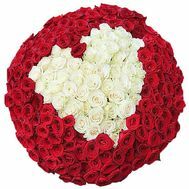 But not only red color is key for this presentation. 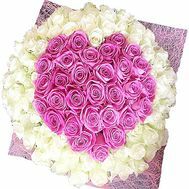 Our florists collect hearts from white flowers, or from buds of pink color, for any occasion. 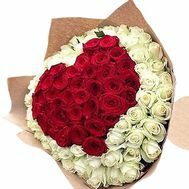 A pleasant gift to the family: a bouquet of red roses in the form of a heart in any quantity will be an excellent gift for Mother's Day, giving the opportunity to express the fullness of feelings. 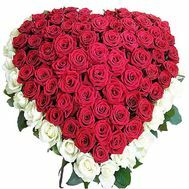 The color and the shape of the flowers will tell all for you, without requiring unnecessary words. 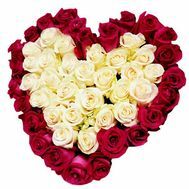 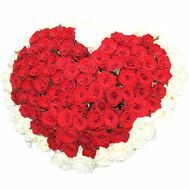 A heart-shaped bouquet of roses is the most popular and most enjoyable gift for women. 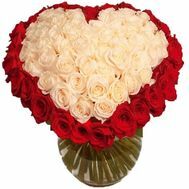 Such a gift will remind you of the feelings and of its sender for weeks, as well as the smell of roses. 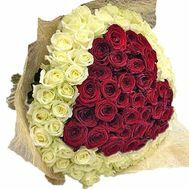 There is nothing more important than pleasant moments, such that you can easily create by buying roses with delivery. 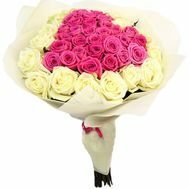 Where to order flowers with delivery to any city? 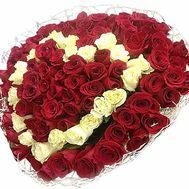 Delivery of flowers across Ukraine from our store is the most reliable, fast and high-quality. 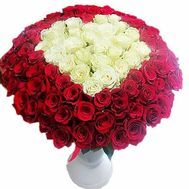 We give 100% guarantee both on the quality of flowers in the bouquet, and on its transportation. 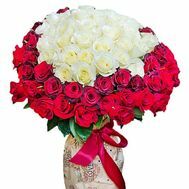 This means that each bud will pass its own, a special check before shipping, and the courier will carry the bouquet carefully. 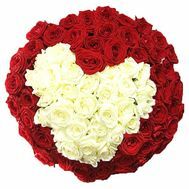 That is why our gifts are so appreciated by Ukrainians, which is confirmed by more than 40 thousand orders made by us. 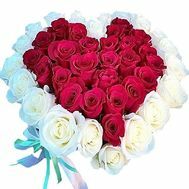 At us you also will find pleasant promotions and discounts, which will help you to save considerably. 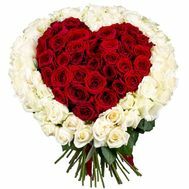 Order a bouquet of flowers in the form of heart with delivery from us, and you and your recipient will learn what real love from a floral salon is!